Tighter safety and security measures, including an increased police presence, will be put in place for West Ham's next home match, following the crowd trouble at their most recent game. There were four separate pitch invasions at London Stadium during Saturday's 3-0 defeat by Burnley. The new measures were announced after an emergency meeting on Thursday. The group in charge of stadium safety also warned that future trouble could lead to closures. London Stadium's Safety Advisory Group (SAG), which includes representatives from the club, police, Newham council, and stadium owners and operators, announced the decision. It has the power to restrict the capacity of the ground or even close it to paying spectators completely. 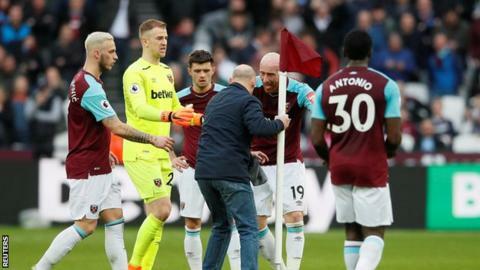 West Ham have said they will seek life football bans for the supporters who ran on to the pitch during last weekend's Premier League match. Co-owners David Sullivan and David Gold were forced to leave the directors' box for their own safety, with Sullivan struck on the head by a coin. Burnley players sheltered a group of young fans during crowd trouble that broke out in the home sections. London Mayor Sadiq Khan described the scenes as "disgraceful". The Football Association has opened its own inquiry and the Premier League also expressed concern at the situation. The SAG said it recognised security had been "stretched significantly by the scale and volume of incidents and stopped most attempted pitch incursions successfully". It said it had now "instructed the stadium operators to make changes to prevent a repetition". The group said it had made "great strides in identifying the trouble makers" and expected "stadium bans will be in place for the next home fixture against Southampton on 31 March". A statement added: "Following reassurances that have been given, it is the SAG's view that the council does not need to use the ultimate sanction, which would see capacity reduced at the venue and spectators excluded. The remaining homes games will be closely monitored. "The SAG must make clear that in the event of future disorder, it would seriously consider advising the certifying authority to take forward this sanction. Playing behind closed doors would be a great shame for the majority of fans who wish to watch and support their team in safety." It is only now that the sheer scale of Saturday's trouble is becoming apparent. Rather than the wholly spontaneous uprising against the club's owners it initially appeared to be, BBC Sport has been told by more than one source some of the problems were organised, with fans communicating on mobile phones before the game outside the stadium to create small scale problems, in a concerted effort to distract. There were also problems inside the ground, which left the directors' box in particular vulnerable. Sixty staff are employed at the London Stadium on matchdays with the specific brief to keep fans off the pitch. As it says in the statement, the majority of these were repelled. A number of supporters present on the day dispute this version of events, although the SAG statement talks of "unprecedented levels of disorder". However, senior sources have also said that the numbers of security staff in attendance were insufficient to deal with the problem as a whole. By the time Southampton visit on 31 March, this has to have been resolved as more protest against the club's owners are planned.